1 ball each of black and white yarn of the same brand/or weight for stripes. *k2, p2 - repeat from * across the round. Repeat the round. Raglan increases: Increase for raglan by making 1 st (m1) on each side of indicated, marked, stitch in every right side (RS) row, or every other round as follows: knit to the marker, m1, sm, k1 (raglan st), m1. 1 edge st, 1 st (left front), 1 st (raglan line, pm before this stitch), 7 (7, 8, 8, 9) sts (left sleeve), 1 st (second raglan line, pm before this stitch), 21 (22, 24, 25, 26) sts (back), 1 st ( third raglan line, pm before this stitch), 7 (7, 8, 8, 9) sts (right sleeve), 1 st (forth raglan line, pm before this stitch), 1 sts (right front), 1 edge st.
Row 2 (WS) and all WS rows: sl 1, purl all sts. Rows 3-14: Repeat 1st increase row six more times. (= 113 114, 118, 119, 122 sts). Row 15/Round 1 (RS, 2nd increase round): knit to the first marker, *m1, sm, k1 (raglan), m1, knit all sts till the next marker, repeat from * 3 times, m1, sm, k1 (raglan), m1, knit to the end of the row. At the end of the row cast on 3 (4, 6, 7, 8) sts, join into the round and continue to work in rounds. Knit to the first raglan marker. Now the beginning of the round will be at the left front raglan marker. Round 3: (2nd increase round): *m1, sm, k1 (raglan), m1, knit all sts till the next marker, repeat from * 3 more times. Next round (3rd increase round): sm, knit to next marker, sm, k1 (raglan), m1, knit to next marker, m1, sm, k1 (raglan), knit to next marker, sm, k1 (raglan), m1, knit to next marker, m1. (4 sts increased, 2 at back and 2 at front, no increases at sleeves). Next round and all even rounds: knit. Repeat 3rd increase round 4 (6, 6, 7, 9) more times. 286 (303, 332, 350, 361) sts. 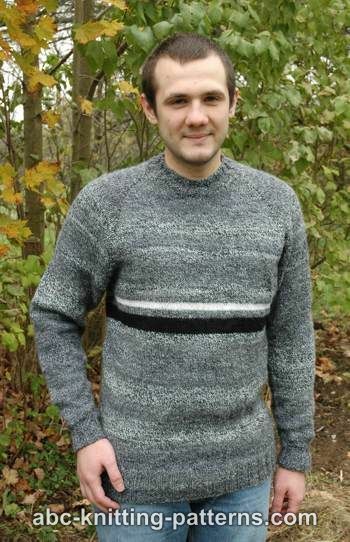 Knit the first raglan st. Transfer left sleeve sts (all stitches between the first and the second raglan lines) to a piece of waste yarn, co 7 (10, 12, 14, 18) sts for underarm, knit all sts of the back, including the raglan sts, transfer the right sleeve sts to a piece of waste yarn, co 7 (10, 12, 14, 18) sts for underarm, knit all front sts. Place a marker after the 3rd (5th, 6th, 7th, 9th) left underarm st to mark the beginning of the round. Slip marker while working. = 181 (200, 218, 235, 252) sts. Work in stockinette stitch 96 (100, 104, 108, 112) more rounds or to desired length, taking into consideration, that there are 10 rounds of 2x2 rib. Work bodice rounds 2-9 in grey, rounds 10-13 in white, rounds 14-17 in grey, rounds 18-25 in black, continue in grey. Work 10 more rounds in 2x2 rib. Bind off. Sleeves are worked in rounds on double pointed needles or circular needles 16" long. Slip the marker while working. Work stockinette stitch for 116 (120, 128, 130, 134) rounds or to desired length, taking into consideration, that there are 10 rounds of 2x2 rib. Decrease round: sm, ssk, knit all sts to the last 2, k2tog. Decrease rounds are 6, 12, 18, 24, 30, 36, 42, 48, 54, 60. (= 47 (51, 61, 66, 70) sts. 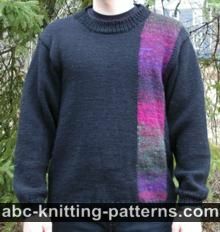 Starting with the central back st, pick up sts on dpn or circular needles along the neckline and knit 10 rounds of 2x2 rib. Bind off. Pattern was updated on September 10, 2018. There are 17 total comments on this article. Have set up ready to do this sweater. Now I'm on the second row = 'work in stocking stitch for - rows increasing for 10 stitches in each odd row'. This may be a UK/Usa language thing or I'm just stupid, but what does the phrase 'increasing for ten stitches' mean? I can't work out if it means 'increase by' within the row itself randomly or increase all rows until you've increased 10 stitches or increase ten stitches at start/end of each alternate row. Everything else is clear. Never done a raglan before so I'm bemused. Thanks. You stop the increases before dividing for sleeves. 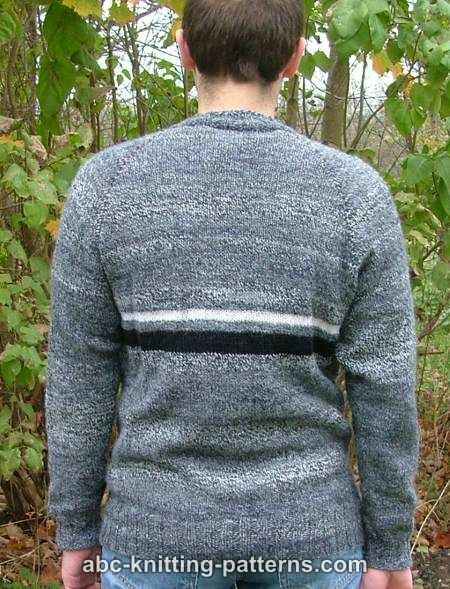 After you join and start working in the round you include selvedge sts in the bodice of the sweater. 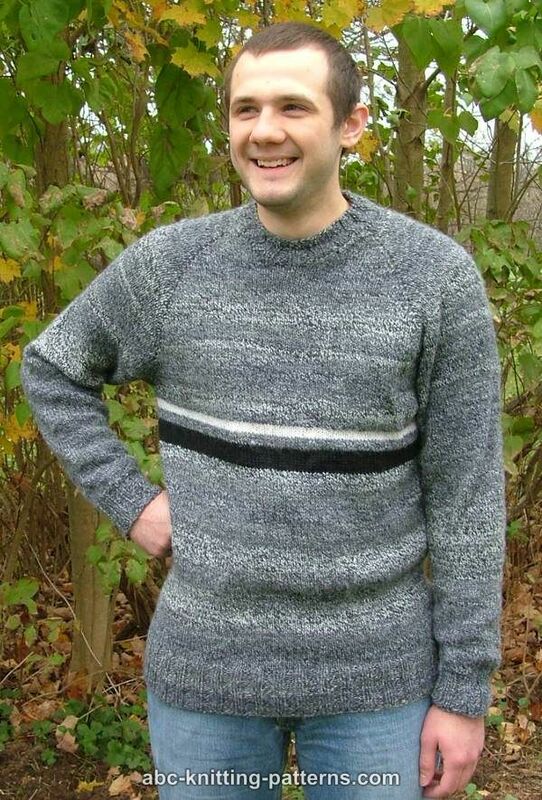 The increases shape the neckline in will be also included in the sweater stitch count. You have to make a double increase at every raglan stitch. If you do this, the amount of stitches in the back, front and both sleeve will increase for 2 st after each increase. You have to make increases at the raglan lines in every odd row until you have to divide for sleeves. 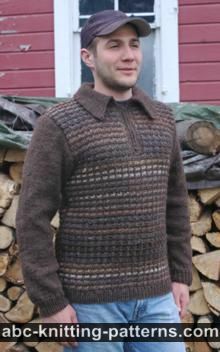 You have to start knitting in rounds since row 19. Totally makes more sense now! I was looking for the answer to the neck question too. 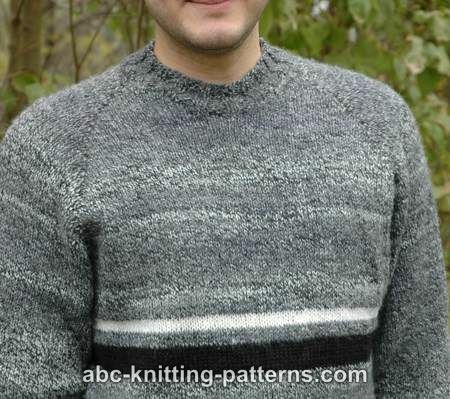 Does the dip in the center of the neck even out or are we suppose to do something to give it the gental curve shown in the picture of the finished sweater for this pattern? 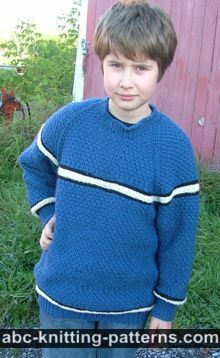 I have knitted many sweaters in the round and have not heard of doing a selvage stitch. This is typically used to make sure the edges stay flat, good for picking up stitches later. Can you please explain the purpose of the selvage in this pattern? I am also assuming that this means if I am to cast on 49 stitches than I am really to cast on 51.